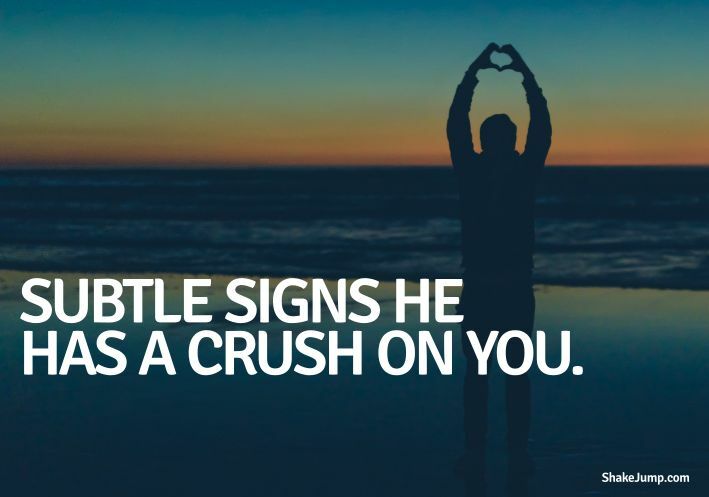 15 Subtle Signs That Indicate He Has a Crush On You – Shake Jump! They say guys are like open books, but let’s be real; they can be very confusing especially when it comes to displaying their love interest. A guy can be crazy about you but he is not going to let it all show because deep down he knows that displaying too much affection can make him come across as weird which could potentially kill the attraction. So how do you find out if a guy has a crush on you? Are there any signs of interest that guys display when they are attracted to someone? Fortunately, yes there are, and quite a few of them. I have complied below a list of 15 signs that guys show when they are in love. Please note that all these signs are not listed in any particular order and it is not necessary that your guy displays every single one of these signs. So without further adieu, here are 15 signs that indicate that he likes you on a romantic level and wants to pursue a relationship with you. Occasionally you catch him staring at you and when you do, he maintains eye contact for a fraction of a second before he looks away so as not to come across as creepy. Males are more visually drawn in than us females so if he finds something attractive, he is bound to stare at it. Point to note is that if he is confident, he will continue to stare and smile at you even after you catch him. He smiles almost instantly and you notice that his face lights up the moment he sees you. You might also notice that his posture improves, in that, he tries to stand straight and more confidently and there is a marked improvement in the way he carries himself in your presence. Guys try to impress girls they like by telling them about their skills and accomplishments like how he got a higher score in a test or how he made his team win with an amazing last minute score. If he likes you, he will lock his eyes into yours when you guys are having a conversation (especially during the pauses). You will also find him smiling every now and then indicating that he is really interested in what you are saying. He also occasionally looks at your lips while you are talking. In other words, he gives you his undivided attention instead of scanning the room or looking around to find something better to do. You will also notice that whenever he strikes a conversation with you or you with him, he tries to prolong the conversation for as long as possible. This is a strong indicator of interest, so make sure that you make a note of this the next time he talks to you. Ever had a guy behave in a weird manner with you? Like making silly jokes about how you look, what you are wearing etc. Sometimes trying to fool around with you, even playfully hitting you in the process? Guess what, guys do this to connect with you. The playful hitting is for them a way to touch you. While we may take it in the wrong way, for a guy it’s like ‘wow, I touched her!’. Of-course there is a difference between playful teasing and teasing done out of spite and they are quite easy to distinguish. Guys try to show off their physical prowess to impress the girl that they find attractive. So watch out for this. If you find him play fighting with his friends when he knows you are watching or taking off his shirt every possible opportunity to flaunt his flawless body, you know he is trying to show off how manly he is to impress you. Lifting heavy weights at the gym while checking you out or hysterically laughing with a group of friends, all of them are ways for the guy to show the girl he likes his masculinity. He is too nervous to speak coherently around you and when he talks you sense nervous laughter, nervous smiles, sweaty/shaky hands to name a few. All are good indicators that his heart is pounding and his pulse is racing when you are near him. If he likes you he will try to get as close to you as possible without of-course coming across as a weirdo. He will try to get noticeably close to your body when talking with you. He will also try to get close to you on random occasions as much as he can. Say you are at a party/gathering and he senses an opportunity to hang out with you; he will ditch his friends and come hang out with you instead. It’s his way of saying he is intimate with you and he wants to get close with you. His friends mess with him whenever you are around. This is a good indication that he has told his friends how much he likes you and in-turn they are trying to tease him about it. This could include, friendly pushing as if asking him to notice you or go interact with you. He tends to like the same things that you do. As an example, you tell him that you like Chinese food and he tells he likes the same. You tell him what your favorite movie is and that just happens to be his favorite movie too. You get the idea. When you are having a conversation, he tries to ask personal questions in an attempt to get to know you better. From asking open ended questions like, how your life is, how your weekend was or how your day is going to personal questions about your family, friends, interests etc. And he will definitely try to find excuses to find your number. He friends you on social networks be it on Facebook, Instagram or Twitter and you notice that he routinely tends to like pictures or every other status message that your post or even leave sweet comment on a few of them. He flirts with another girl in front of you all the while trying to discreetly notice your reactions just to see if you feel jealous or bothered by it at all. Subconsciously, this is also a way for a guy to show his lady love that he is sought after material and that women love him. You see a marked improvement in his appearance/hygiene. You also find him groom or fix his clothes around you. If you find him fiddling with his clothes to fix them it’s because he is trying to look presentable around you. It is true that this could be because he has the hearts for any girl and not necessarily you, but coupled with a few of the above signs, it becomes a strong indicator of interest. He tries to get physical every opportunity possible. Like when he hands something to you, he ensures that some part of his skin brushes yours. He might find a lint or leaf on your hair and pick them out for you. He might rub a smudge off your cheek. If you are close friends, he will find excuses to hug you. As mentioned above, these signs are not listed in any particular order so one is not more important than the others. Also point to note is that every guy is different so they may not give out all of these signs, but the more signs there are, the more the chances that he finds you special.